A few days ago, as I was heading upstairs to do my lights and darks in our shared laundry room, I was surprised to find an honest-to-goodness standalone arcade video game staring me in the face. Instantly, a few things ran through my head, such as “I didn’t think the service elevator went to this floor?” and “maybe this is for a scene from the remake of that pinball wizard movie?” Upon further inspection, I came to realize it was a social media marketing campaign stunt by none other than Headquarters Beercade. HQ Beercade is a local Chicago bar in Lakeview that boasts over 37 arcade games, old and new. They are currently in the process of opening up a second location in River North – and are employing a genius marketing technique to do it. The premise of the campaign is this: “Play a game on us and share your score on social media by tagging it with #HQRiverNorth. Each post earns you an entry into an exclusive drawing: the chance to win an invitation to check out the new HQ Beercade before it opens to the public. Game on!” After I got over my initial excitement, and being the social media marketing nerd that I am, I realized why exactly this social marketing campaign makes so much sense. 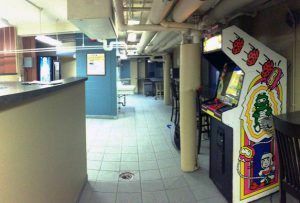 HQ Beercade knows who they’re talking to- I speculate they knew exactly what they were doing when they placed an arcade game in the laundry room of my mid-rise apartment building, comprised mostly of mid-twenty to thirty year olds that frequent the River North neighborhood. They knew we’d get a kick out of the novelty of the experience, and that there was a good chance we’d participate. They know what their audience is passionate about, and they are passionate about the same thing. HQ Beercade is in the business of making sure people have a good time while drinking craft beers and playing arcade video games. Did they talk about their drink specials? Nope. They got right down to the business of demonstrating how fun the experience can be – even if it is while you wait for your socks to dry. Their marketing message is clear and simple, and therefore, resonates soundly with their audience. In the world of social media, this is probably one of the most important steps in the marketing cycle you can take to ensure your efforts result in conversion – especially if your business goal exists outside of the Internet. You may get great marketing awareness out of it, but it’s not enough to just promote your business online – you’ve got to get people involved with your company and create relationships with your brand. HQ did this perfectly through the design of their promotion. Yes, they will get people talking about the opening by posting pictures of their high scores to social platforms – but each post gets you an entry to actually attend a pre-launch event. In person. Before anyone else. How cool will THAT experience be?! That will create not only buzz, but also loyal customers who have engaged with the brand and will visit time and time again. In conclusion, it is important to remember the simple elements of what makes social marketing campaigns successful. You will never get your customer to engage if you aren’t giving them what they want. To be successful, you need to really listen to your customer’s needs, and make sure your marketing efforts align with delivering fulfillment.